This game sees players help Houdini complete his tricks, be a part of his magic and complete missions in secret. The game includes 10 stage modes, 3 magician modes, 1 master magician mode, 5 secret combo magician modes, 5 Houdini silent movie modes, 5 jail escape hurry ups, 1 video mode and milkcan playfield multiplier. Embodying all escapes and illusions of the traditional Houdini legend, this machine is hard to escape from (but you'll have fun trying). 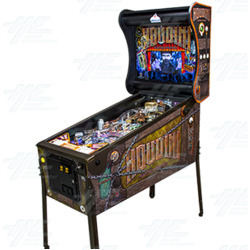 The game includes 10 stage modes, 3 magician modes, 1 master magician mode, 5 secret combo magician modes, 5 Houdini silent movie modes, 5 jail escape hurry ups, 1 video mode and milkcan playfield multiplier. Embodying all escapes and illusions of the traditional Houdini legend, this machine is hard to escape from (but you'll have fun trying).